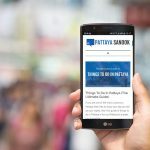 If you are looking for a good sports bar in Pattaya that serves American food and cold beer than Hooters Pattaya location may be for you. The restaurant is probably best known for their beautiful wait staff dressed in tank tops and orange hot pants, but their food is really good too. 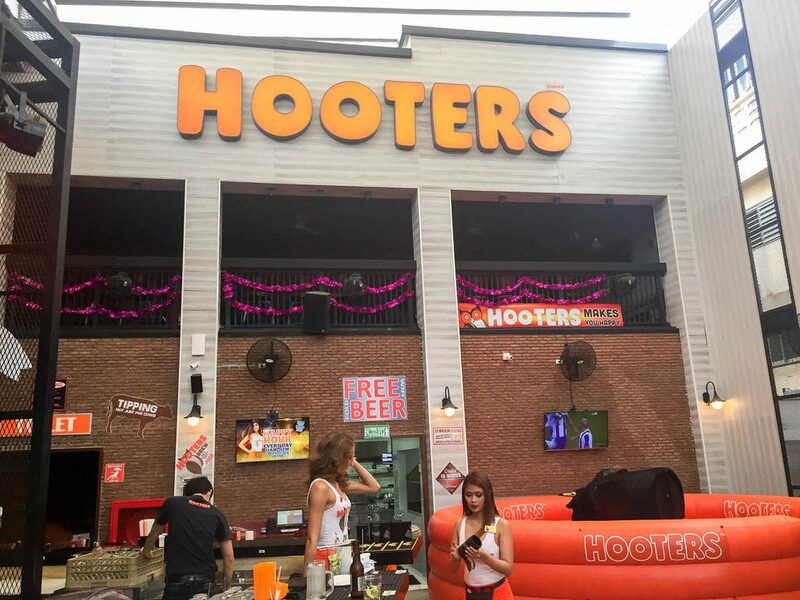 Hooters opened in January 2016 at a prime location on Beach Road near Soi 13/1. It’s a beautiful building with a full bar, plenty of seating, pool tables, TVs, and even a mechanical bull. There is a large patio out front where you can enjoy the weather on a good day and overlook the ocean. 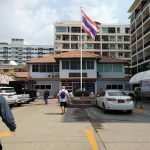 I visited Hooters several times on my last visit to Pattaya and sampled a few of their dishes and many of their beers. 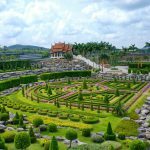 In the following review, I’ll go over my experience and give you an idea of what you can expect. The menu at Hooters includes chicken wings, chicken sandwiches, and burgers. They have a very big appetizer menu that is great for sharing if you want more of a light snack. For those who want a healthier or lighter meal, they also offer several salads to choose from. 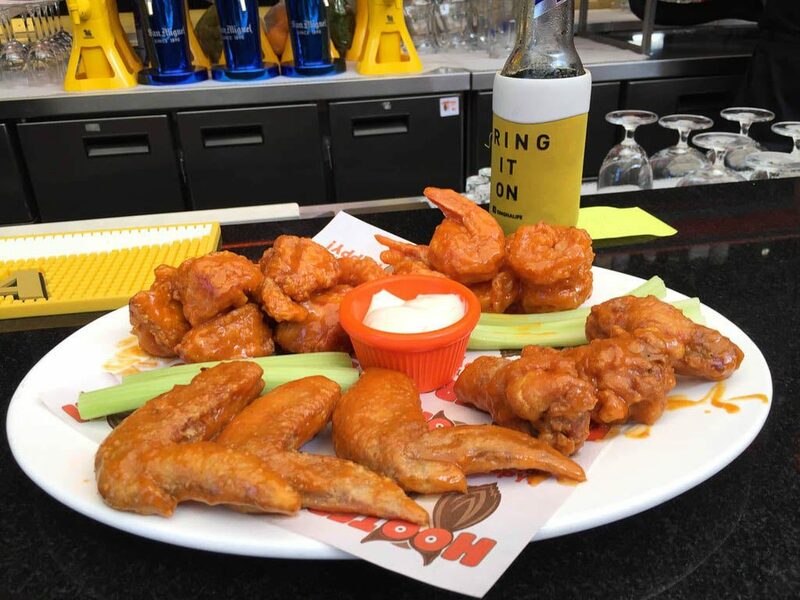 The chicken wings are the signature item on the menu and you can have them seasoned with a variety of sauces, from the traditional buffalo wing to a variety of signature sauces like chipotle honey or parmesan garlic. I had a couple of separate meals here, so I’ll share two of my favorites. 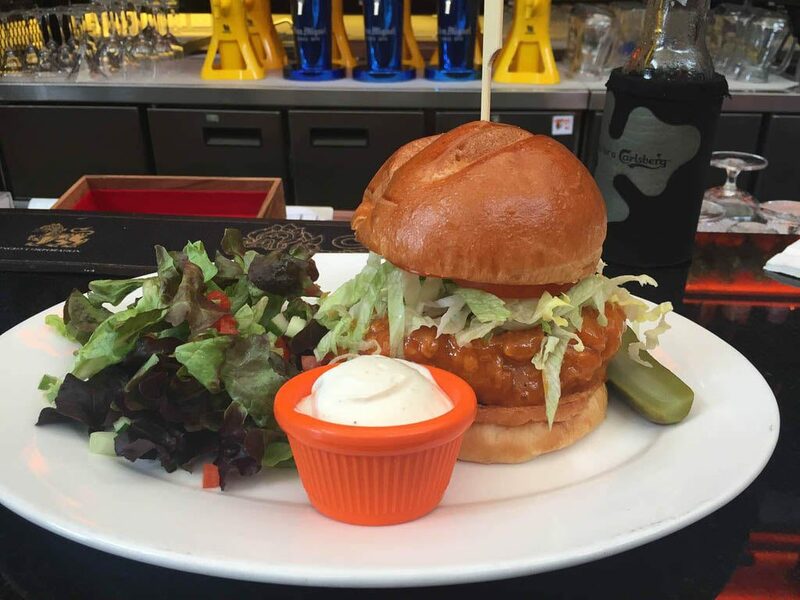 The first was their Buffalo Chicken sandwich. I opted for a side salad instead of fries. The chicken breast was large and cooked well, it was moist and tender. I went for the traditional buffalo sauce in medium which was just the right amount of spice. The salad was a little disappointing as it was a small portion of mixed greens on the side of the plate. I had ordered a small caesar on another occasion and was expecting a similar sized salad. Substituting is cheaper but a much smaller portion. I would have just gotten the fries if I had known. Overall I was very pleased with my meal. On another visit, I went big and ordered the Buffalo Platter. This is a lot of food with a price tag to match (560 Baht). It has 6 boneless wings, 6 buffalo shrimp, and six wings. The boneless wings and buffalo shrimp were my favorite. It was a lot of food, but once again very good. The service staff at Hooters if fun, friendly, and professional. I was greeted with a smile at the entry and where I told them I wished to sit at the bar. After picking out a seat the bartender came over to introduce herself and wrote down her name and the WiFi password on a sticky note which she placed in front of me. The restaurant and bar were busy but not crowded and it was easy to place my order and I received it quickly. The bartender stopped by to check on me often to make sure things were all good. Every 30 minutes the service staff come out and do a choreographed dance number to the music before heading back to their stations. It’s cute, but to be honest I’m not sure what it is all about. I guess it is just adding to the fun atmosphere. If you want to see live sporting events Hooters Pattaya is a great place to check out. They have 40 TVs located throughout the bar with several big screens over the bar itself. They play a variety of sporting events and even have live UFC fights. 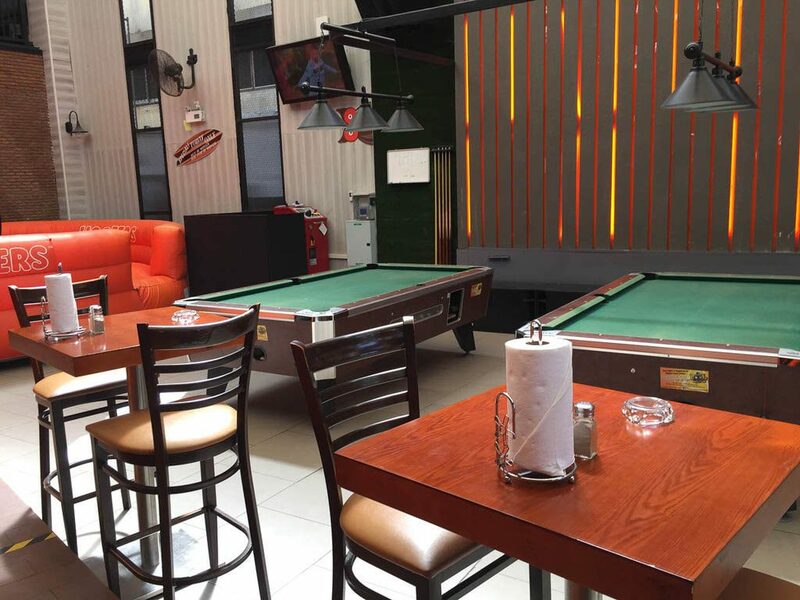 Hooters also offers visitors a few other amenities such as a couple of pool tables which are in great shape. WiFi is free, our servers provided the password without us needing to ask. The one feature that stands out is the mechanical bull in the back corner. It didn’t seem to get much use during our visit, perhaps during the evenings, it sees more riders. Though on one visit we were treated to some of the Hooters girls taking turns riding the bull. Sorry I didn’t get any photos of that. One of the things that turns people off from eating at Hooters in Pattaya is the price. While I’m happy to pay a little more for some good Western food, others might balk at the costs. What I did have an issue with is them charging for an extra side of Ranch at 65 Baht. When you’re spending 700 Baht for a meal and a few beers it seems to me they could throw in an extra dipping sauce or two. Beer prices start at 100 Baht for a draft or 140 Baht for a bottle. Which is closer to pricing you’d find at a Walking Street GoGo or Dance Club. 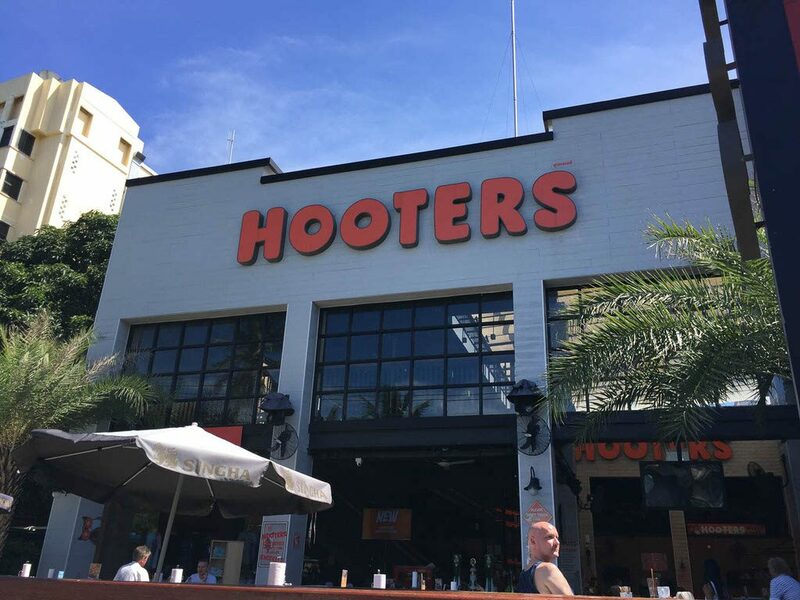 Overall I found Hooters Pattaya location a great place to grab some U.S. style bar food in a fun and friendly atmosphere. It’s a restaurant I’ll no doubt return to on a regular basis.